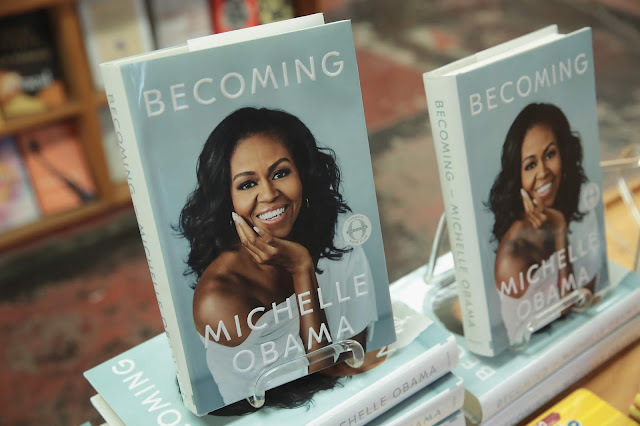 Michelle Obama's memoir "Becoming" has become the best selling book of the year in the United States, surpassing Michael Wolff's "Fire and Fury" and others. Wolff's "Fire" was a publishing world sensation when it came out in January. To date it has sold 1,008,088 hardcover copies, according to NDP BookScan data. All year long, it was the year's No. 1 political book. Its closest competitor was "Fear," by Bob Woodward, which came out in September and has sold 872,567 hardcover copies to date. But "Becoming" outpaced them both in just a couple of weeks. BookScan shows 1,122,618 hardcover copies of Obama's uplifting memoir have sold since its November 13 release date. That makes it No. 1 for the year. The year's No. 2 book in terms of hardcover sales is "Magnolia Table," a cookbook by TV star Joanna Gaines. "Fire and Fury" now ranks No. 3, followed by Rachel Hollis' self help book "Girl, Wash Your Face" at No. 4 and "Fear" at No. 5. Obama's publisher, Penguin Random House, said Friday that "Becoming" "sold more than 2 million units in all formats and editions in the U.S. and Canada during the first 15 days of its publication." The hardcover edition of "Becoming" is now up to six printings, meaning the publisher has had to order more and more copies to keep up with demand. By the end of the sixth printing, there will be 3.4 million copies in print in the U.S. and Canada, well-timed for the holiday book-buying season.